The beetling, discomfiting and windowless AT&T Long Lines Building looms over tiny Trimble Place looking north. The building is a telephone exchange or wire center building which contains three major 4ESS switches used for interexchange (long distance) telephony, two owned by AT&Tand one owned by Verizon. The building is said to have the largest blank wall in America, and is also thought to be able to survive two weeks of nuclear fallout. The New York Times remarked that it “blended into its surroundings more gracefully” than any building nearby. There must have been some prime weed in the Times’ bathrooms at the time. This is the ugliest work of architecture in NYC not featuring Fedders or Friedrich air conditioners and concrete lawns. 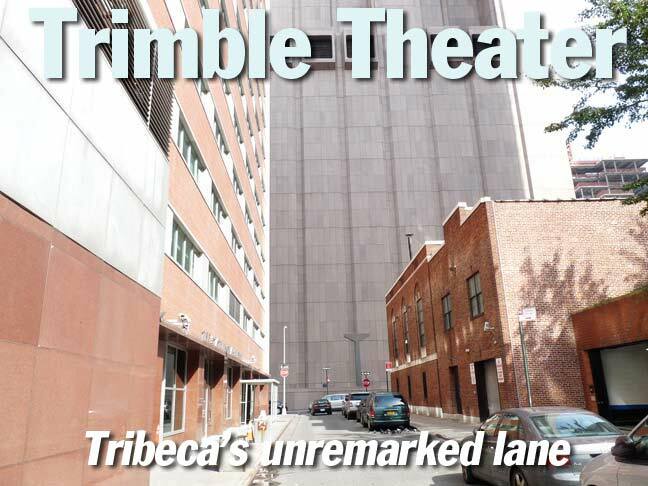 Trimble Place, a very short, one-block lane in Tribeca, between Duane and Thomas just east of Church, is the only remnant of New York Hospital’s former downtown location. 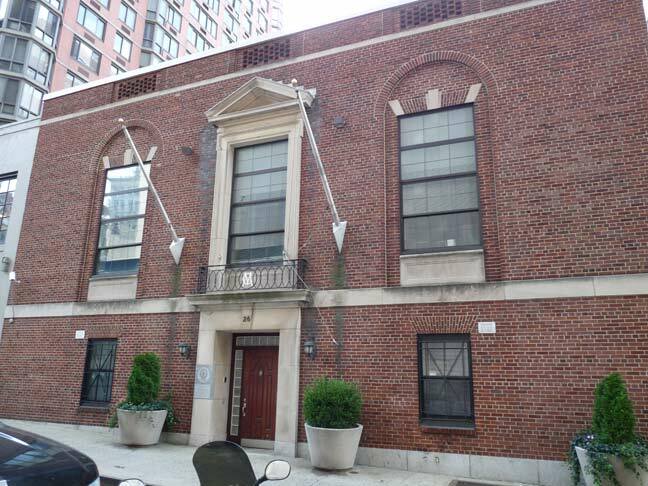 Now New York-Presbyterian, located in Washington Heights near the George Washington Bridge, NYH was chartered by King George III in 1771 and opened in 1791, after US independence had been won. The hospital pioneered the treatment, by surgeon Wright Post, of aneurysms and other arterial problems in its early days. Post’s work in vascular ailments was carried on by Valentine Mott. 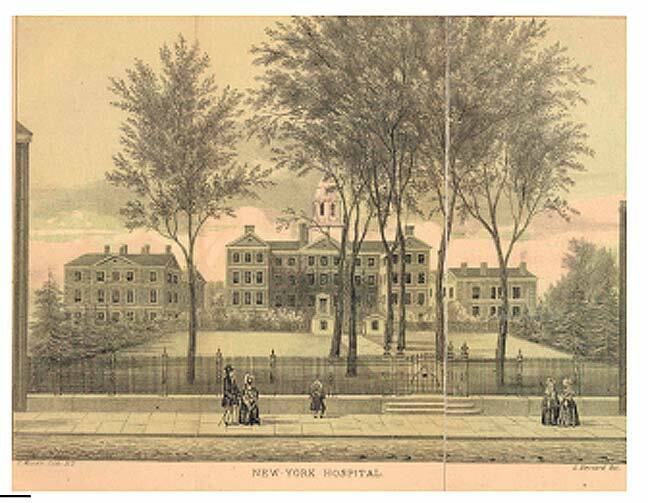 Above: Dripps atlas section, 1867, showing the New York Hospital campus. 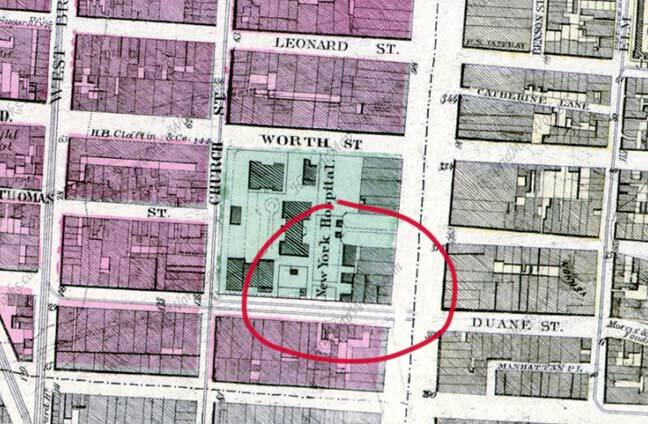 NYH outgrew its original location by the early 1870s and then moved uptown, but one of its carriage lanes was left over and became a mapped public street in 1874. It was named for George Trimble, director of New York Hospital at the time, and an officer of the Public School Society and local merchant. Looking south from Thomas Street. Trimble Place is short enough that is has no lamppost to call its own, but supports only northbound one-way traffic. The back door of the State Insurance Fund building, fronted on Church Street, empties onto Trimble Place. At Duane Street, Trimble Place meets some storefronts as the peak of the new #1 World Trade Center peeps over their rooves. You sir are a linguist. Obviously rooves is the plural of roov or the thing that keeps the rain from soaking your living ruum. It’s also the dogsh#t capitol of Tribeca. Watch your step. I worked at AT&T Long Lines as an Overseas Operator in the ’70s. The address is 32 Av. of the Americas. 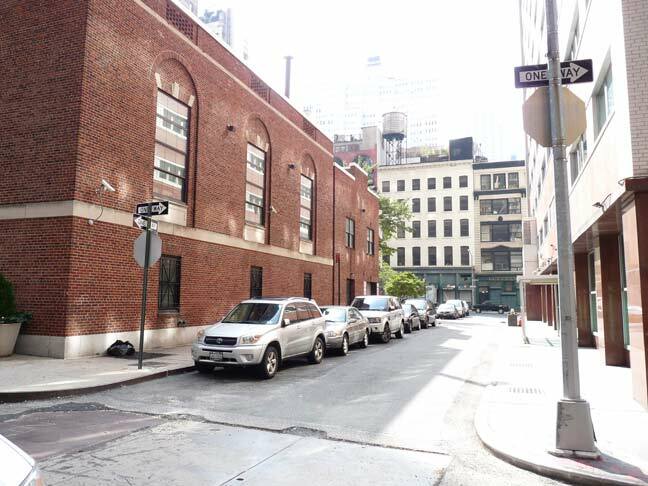 It is bordered by Walker, Church and Lispenard Streets. It has windows! That must be another phone company building. A little notational remnant of the hospital is on the 1883 map. Notice there are only two lot numbers 815 and 830 where the hospital was, and they had to squeeze in lots called 815A, 815B, etc, when the property was subdivided. The narrow 815Z and 830Z are where the hospital property ran out to Broadway. 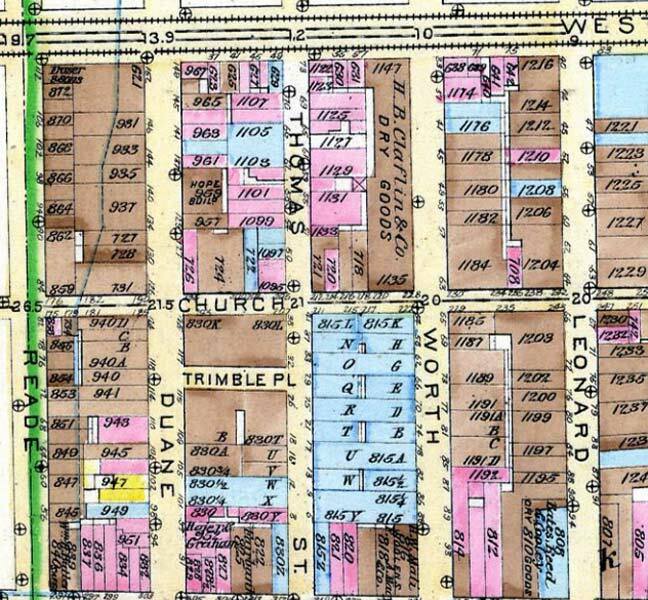 In fact that make me suspect the coloring on the 1867 map is wrong, and the other buildings along Broadway were not part of the hospital. The AT&T building is 33 Thomas Street. I know most of the phone company buildings in NYC from my years in the elevator business. 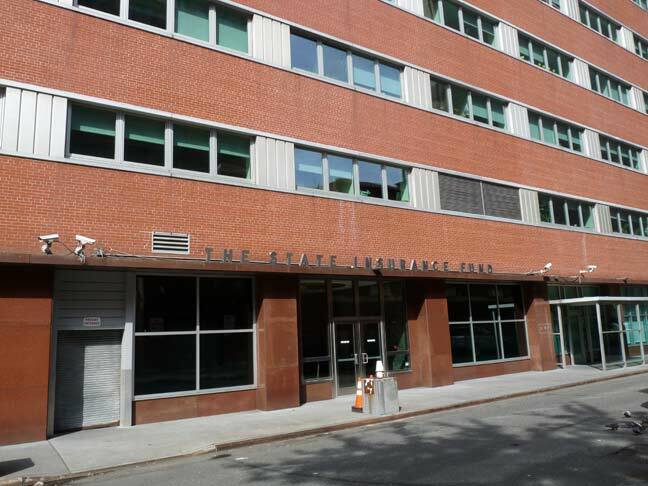 I was an employee @ The New York State Insurance Fund from 1977 – 2004. I remember as a teenager thier use to a Type 24A modified (AKA as a Bishop Crook Lamppost) on the S.W. corner of Trimble Pl. & Thomas St. It was hit by a vehicle in 1974. I was a Long Lines employee who spent many years in 33 Thomas St. It was originally only finished on 3 sides; the east side being only a block wall. 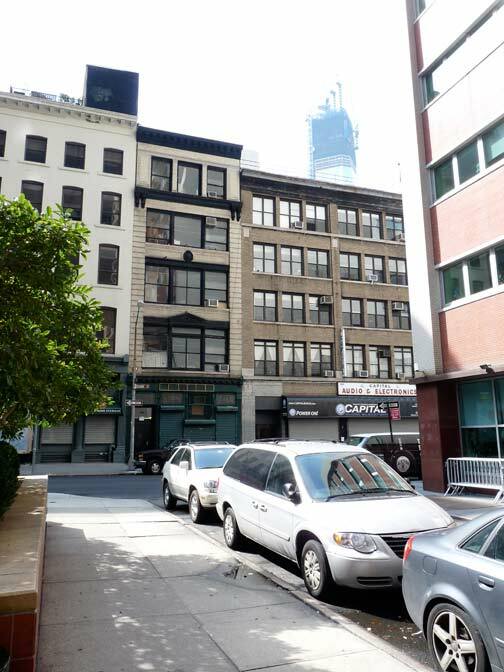 The intent was to expand the building to Broadway as the first address was 323 Bdwy I, among others, used to pick up the mail in a small loft above 323 which, I think, was Stark’s Steakhouse. By the mid 70’s the expansion was canceled and the east wall was was covered with the previously purchased granite. The address was changed to 33 Thomas St at that time. I worked for years as a TTY repairman in 33 Thomas and what Hugh says about the address is correct. The buildings on B’way were cast iron front and couldn’t be torn down. As part of the deal with the City, in order to build the structure ATT had to provide “X” amount of open, public space. For that reason the building was never extended to its planned footprint, the granite was installed and a concrete covered open area was left. PS..Kevin….I was the FNYer that tipped you to this alley about 15 yrs ago ;).